Do you love the look of a classic roll-top bath? Traditional bathroom design never goes out of fashion, providing limitless options for creating a stylish combination of classic and contemporary. Concept Virtual Design can offer classic interior design that will suit your personal requirements for a luxury bathroom, from fixtures and fittings to furniture and all the little details that make your bathroom truly bespoke. This traditional style brings to mind Victorian design with its roll-top baths, wooden panelwork and black and white chequerboard floor tiles. 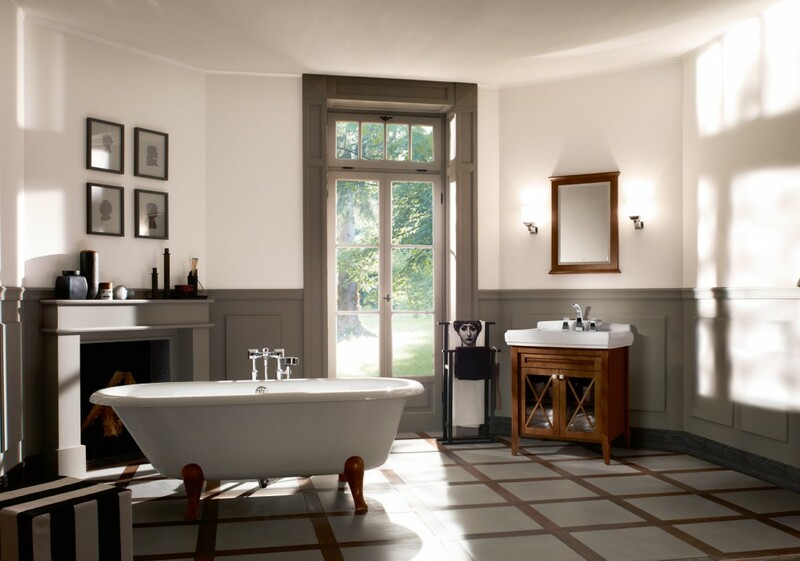 How you translate classic design into your bathroom is up to you, but a good place to start is the bath. Incorporating a classic bath into your bathroom is a great way to bring a vintage touch while also being able to complement the look with other more contemporary aspects. Because a roll-top bath stands alone, it will look striking in almost any surroundings, allowing you to update the style with modern wallpaper and tilling, or continue the classic look with traditional taps and antique furniture Classic baths look stunning in period properties as well as new builds, and offer a centrepiece for a spa bathroom or luxury en suite. Match your roll-top bath with a pedestal basin, marble counters, intricate tiling and sumptuous colours, or contrast this traditional design with sleek seamless vanity units, atmospheric lighting and floating shelving. Discuss your ideas for a classic bathroom design with Concept Virtual Design and our experts will help you to create the perfect interior design for your luxury bathroom. This entry was posted in Luxury Bathrooms. Bookmark the permalink.